"While on our honeymoon in eastern West Virginia, Joe and I frequented the 'Purple Fiddle', an eclectic coffee shop and cafe with yummy wraps, soups, sandwiches, and the best hummus I've ever tasted! Once we visited for the second time, I just had to ask one of the employees what the secret was to this 'it's got a kick to it' hummus: red cayenne pepper, not just black pepper, alongside cumin, sea salt, and fresh cilantro. Yum! 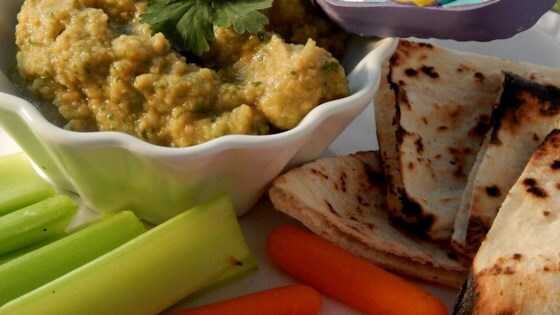 I could eat this hummus with anything from carrots to grilled pita wedges! Garnish hummus with extra cilantro (and lime slices if you have them)!" Pulse garbanzo beans, cilantro, and onion in a blender or food processor until roughly chopped; stir. Add garlic, cumin, cayenne pepper, and sea salt; pulse, adding reserved garbanzo liquid until desired thickness is reached. Pour olive oil and lemon juice into hummus and stir. Lime juice can be used in place of lemon juice. Made it exactly as noted in my food processor. Had lots of cilantro to use from my garden. Fresh with a kick. Could eat it all in one setting.